Congratulations on choosing Big O Tires as your provider of tires and automotive services and, in the process, becoming eligible for Big O Roadside Assistance! Big O Roadside Assistance provides 24-hour roadside emergency service anywhere in the United States and Canada, seven days a week, 365 days a year, to Big O customers that have purchased eligible tires and/or services. We are ready to help you every day of the year, anytime, anywhere. 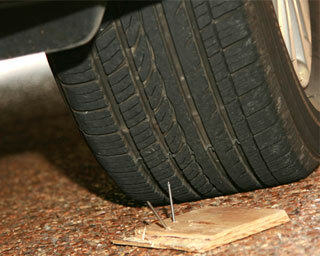 Flat Tire Changing Assistance — Assistance will be provided for the installation of your useable spare tire. If you are in need of flat tire changing assistance for a tire that you purchased from an active Big O Tires location, you must call 800-351-8545 to be connected with the nationwide service provider. You must have your Big O Tires invoice for the purchase of eligible tires available at the time of the call. Flat tire changing assistance will be provided at no charge to you, up to a maximum of $75. You are responsible for any and all charges over $75. The service provider requires use of a credit card to arrange for dispatch. If you are in need of additional roadside assistance services you must call 800-351-8545 to be connected with the nationwide service provider. You must pay for the services listed below. The service provider requires use of a credit card to arrange for dispatch. You will be reimbursed for covered services up to a maximum of $75.00 per occurrence. Lock Out Service — Assistance will be provided in unlocking your vehicle in the event the keys are lost or locked inside. Fuel, Oil, Fluid and Water Delivery Service — An emergency supply of gasoline (where permitted), oil, fluid and water will be delivered to your vehicle. You must pay for the costs of the actual fluids delivered. Jump Start — The service provider will jump start your vehicle in the event your battery becomes discharged.